Call 810-643-1051 to schedule your first appointment. If you're interested in learning more about how hearing aids can improve your ability to fully participate in activities and engage with others, the hearing care specialists at Miracle-Ear® will be available to assist you. We'd be happy to explain how our hearing solutions, including our new GENIUS™ Technology, have been designed to function effectively in a wide variety of environments, and we can answer any questions you have. We’ll even give you a free hearing test* when you come into our location in Sandusky so that you have a better understanding of your strengths and weaknesses. You can rest assured knowing that our hearing aids are an easy and practical way to address hearing loss. Instead of being timid about entering into conversations and worrying about being able to follow what's going on, you can socialize with confidence with the assistance of our products. If you ever need to adjust your sound, you can discreetly do so through the GENIUScontrol app** on your Apple or Android smartphone. The hearing care specialists at our hearing aid center can give you the information you need to get the most out of your hearing aids. Come visit our Miracle-Ear location to see why so many people come to us when they're searching for hearing aids in Sandusky, MI. We'll partner with you and assist with free hearing aid repairs whenever you need them. Our hearing care specialists will fully support your efforts to make a positive change in your life. When you discover and experience the Miracle-Ear advantage, you'll see why we're America's most recognized brand of hearing aids and why we've been able to build our network to include more than 1300 locations nationwide. 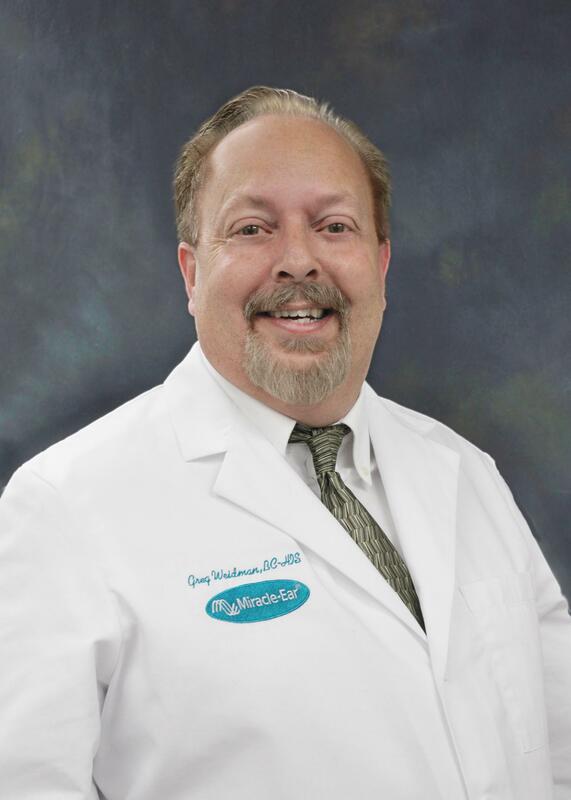 Greg Weidman is a Board Certified Hearing Instrument Specialist and lifelong resident of Saginaw. He has been with Miracle Ear for 23 years. His mother Ann Weidman was also a Hearing Instrument Specialist with Miracle-Ear for 35 years and retired several years ago. Greg states that his favorite part of being a Hearing Instrument Specialists is just being able to work with people. "My personal goal for each client is to help them achieve their goals for better hearing!"